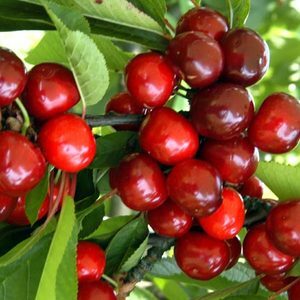 Sweet Cherry Hertford fruit trees - The Royal Horticultural Society has given it its prestigious Award of Garden Merit (AGM). Notable for its very heavy yields of large firm dark red-black fruits with pink to red flesh. Excellent quality fruit full of exceptional flavour. Picking time late July. I come back to Blackmoors time and time again because the fruit stock is second to none; the customer service is excellent; the packaging is sturdy; despatch is swift ie a few days rather than weeks. Again, this Hertford I have just received is one fine specimen. Thankyou so much everyone at Blackmoors. I love my tree!